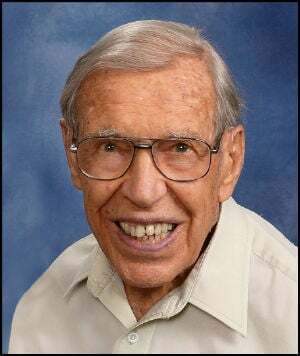 Aaron Fair Moon, 95, of Lincoln, died April 5, 2019. Born February 20, 1924, near Motley, Minn., to George and Belle Moon. During World War II he served as a U.S. Army medic in the South Pacific. Married Evelyn Adams August 17, 1947. Aaron taught for 35 years in public or Seventh-day Adventist elementary schools. Retired at 62 and lived 33 years in the Cheney neighborhood of SE Lincoln. Survived by wife, Evelyn, of 71 years; daughter, Nancy (Harvey) Meier; sons, Jerry (Sue) and Larry (Joan); grandsons, Brad (Michaela) Moon, Howard Meier, and David Meier. In lieu of flowers, memorials are requested to College View Academy, 5240 Calvert, Lincoln, NE 68506 (www.cvak12.org). No service. Come and go visitation with Evelyn 4-6 p.m., Wednesday, April 17 at Holmes Lake Rehab, 6101 Normal Blvd, Lincoln, NE. Condolences may be left at www.aspenaftercare.com.